Customers browse through items at a street fair organized by New College students. When entrepreneurs Lauri Contarino and Erica McReadie saw the empty drive-through window vacated by a bank in downtown Bradenton, they saw a coffee shop. Professor of Sociology and Environmental Studies David Brain saw the space, which Contarino and McReadie named Tellers Coffee, as an opportunity for his independent study project (ISP) students to build community through a tactical urbanism project. The goal of the ISP was to bring small business owners together and empower them to change the downtown landscape using limited financial means. 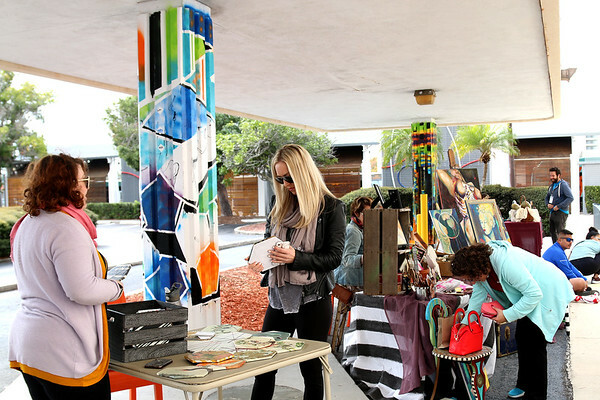 Lobeck and her five classmates converted the parking lot adjacent to Tellers Coffee into a street fair with the help of Realize Bradenton, which connected the students with the coffee shop’s owners. “We are a place-based economic development nonprofit that uses arts, culture, history and food to bring people together for economic development, greater downtown vitality, and quality of life,” said Realize Bradenton Executive Director Johnette Isham. The organization is especially interested in fostering a sense of community and pride among young people, whom it encourages to invest in the place where they live. Throughout the month of January, the students solicited business owners, booked performers, organized family activities, and promoted the event to the Bradenton community. Students worked directly with Realize Bradenton to organize the event because the space adjacent to Tellers belongs to the coffee shop, not the city, which allowed them to bypass the permitting process. Brain and Isham cautioned the students to be realistic when measuring the success of the street fair. Attendance for a first-time event would be low, they said, especially since Tellers Coffee is not along the newly renovated waterfront. 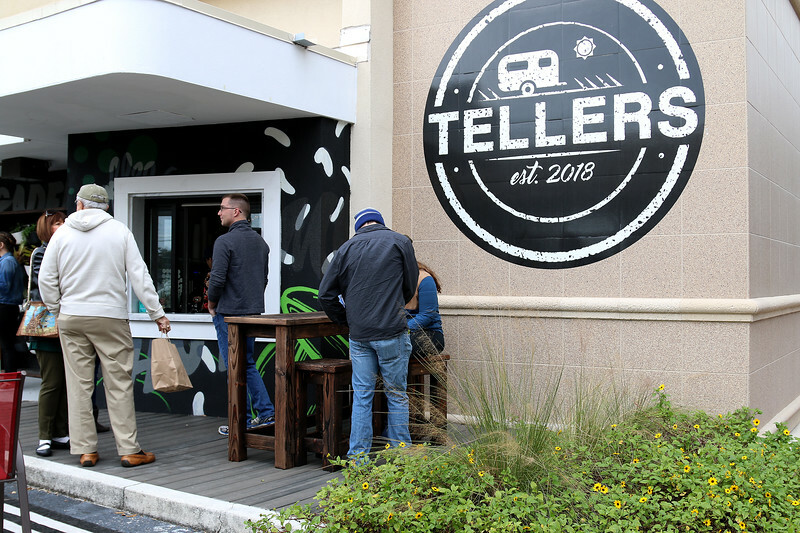 Customers wait in line at Tellers Coffee during the street fair organized by New College students. Spence enrolled in Professor Brain’s ISP and was responsible for recruiting vendors for the pop-up event. Recruiting vendors helped Spence, who is a veteran, not only build community among the business owners, but also for himself. Brain was pleased with the students’ accomplishments in only three weeks and hopes they will use the skills they learned to carry out similar projects in the future.